IrishCyborg shares the latest books he is reading. I am a twelve-year-old kid, so you might be wondering, why Sherlock Holmes? Well, first of all, I like lots of books, from The Hobbit to the Ender quartet. I partly wanted to read this book, because in our house we sort of have a competition to see who can read famous books first; so I decided to read Sherlock Holmes as soon as I could. However, a big reason for reading these books was that I had watched the movies first. We only rarely watch a movie before reading a book, but Sherlock Holmes was an exception. 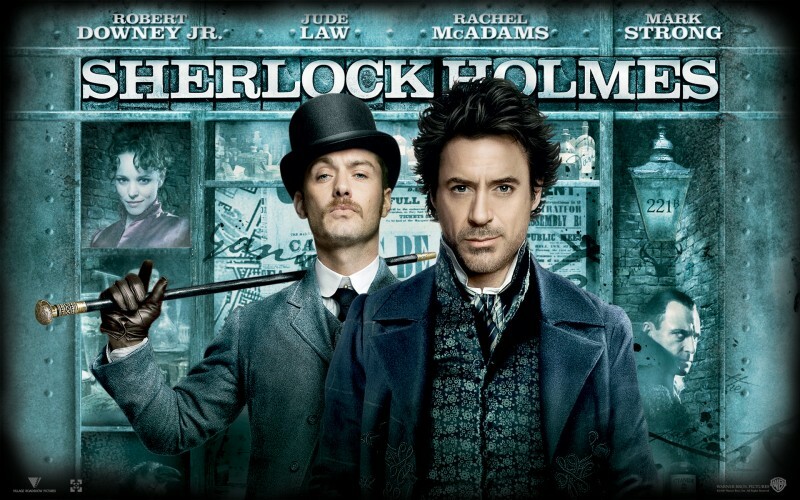 I watched the films which have Robert Downing Jr. acting as Holmes, so I wanted to see if the book version was as funny. He isn’t really funny in the book, but it’s still really good. ‘I daresay’ I actually may have picked up a phrase or two from this book. Sherlock Holmes: The Annotated Edition are beautiful books. The three dust jackets together show a picture of Holmes smoking his pipe, and on the front they show some great pictures of him. Under the dust jacket, there is the same picture of Holmes with his pipe. The box set of Sherlock Holmes is rather hard to take off of a shelf, however it helps with storage. Also, each of the three hardback books has a different color that I like. The books are set in Victorian England, which was when the author, Sir Arthur Conan Doyle lived. It was an age of new discoveries, and people were becoming more aware of the world around them. Holmes and Watson live in a rented house with Mrs. Hudson, their landlady, but move all over England so that they can visit the scene of the crime. Cars were just being invented, so they mostly travel by train when they are going out-of-town, and by hansom-cab (a carriage pulled by horses) otherwise. Even though it all happened 200 years ago, these books can make it feel like now. Sherlock Holmes has a storyline that sometimes tests your abilities. Holmes takes a logical view of the case. The book supplies you with all the facts, but try as you may, it is nearly impossible to solve the case. However, when Holmes begins to unravel the mystery, it becomes more and more simple, and when he’s solved it, you are left wondering “How’d he do it?” Even after reading a lot of the stories, you still can’t seem to figure him out. The stories of Sherlock Holmes are quite gripping because of this. This version of Sherlock Holmes comes with over 3,000 annotations and over 400 illustrations spread over three volumes. The annotations can be little (or sometimes big) facts about the time, the place, or what they are talking about when they say the Scottish Yard (it was the Victorian police base) or they can be the meaning for the slang that was used back then. Also, whenever there is a picture for a section of the text, it is shown along with the name of the picture and the artist. However, the annotations take up at least half a page, and when there are a lot of notes it can take up a full page or more. I find that when there are a lot of annotations, I need to skip forward a page or two to find out the fact. Additionally, the whole book is written as if Holmes and Watson were real, and Arthur Conan Doyle was just Watson’s editor. I think this is common practice among Baker Street Irregulars, a group of people devoted to Sherlock Holmes and his world of which Leslie L. Klinger, the editor, is a member. 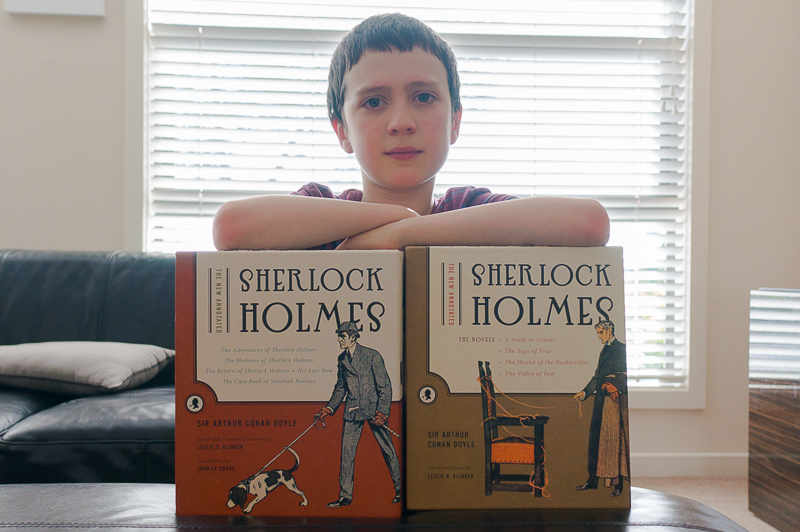 All three volumes also contain detailed timelines of Holmes, Watson, and the author’s lives. The timeline also has important events in England, the Continent, and the world. These annotations and the illustrations together make the book interesting, but sometimes they distract you. If you don’t think you need the annotations, then buy the regular edition. There are two sets of stories in Sherlock Holmes, the short stories and the novels. The short stories are like a very long chapter of Holmes’ adventures solving a simple but often challenging case. The novels are split into parts, each part having a few chapters. In the novels, you occasionally get an insight into the past as one part shows something that happened to the client, and usually have a more complicated case. Two of the novels, A Study in Scarlet and The Sign of Four are the preludes to all the short stories. There are many characters in Sherlock Holmes. There are the two main characters, Sherlock Holmes and Dr. Watson. Then there are a wide variety of clients looking for Holmes’ help. Sometimes, the client is Constable Lestrade or some other officer from the police force, asking for help with some mystery or another. In those cases, Lestrade or the other person usually accompanies them on the case. However, ordinarily, the clients are people from all over England, or even beyond. They can be rich or poor. Then there is the lord of all crime, Professor Moriarty. He is featured only rarely. Occasionally, Dr. Watson’s wife, Mary Morstan, is also involved, but usually only a tiny bit. All these characters blend with the places to create Sherlock Holmes stories. The 2009 Sherlock Holmes movie is very different from the book at times. Holmes’ personality is essentially the same, except that he’s funnier in the movie. Dr. Watson is smarter than in the books, and Holmes’ criminal girlfriend from the film was only in one short story. Professor Moriarty has a better temper than in the stories, and a good few characters were made up. However, altogether I found the film more enjoyable than the book… because I’m a kid. Movies are more visually action packed, and easier to ‘see’ what happens, although I loved the books too. This book is pretty easy to read, because any slang you don’t know is probably olden-day and is explained in the annotations. I would say to be at least twelve years old and have a good attention span. My favourite thing about Sherlock Holmes was following him along. It was challenging but fun. WARNING: One story in Volume 1 is called the Cardboard Box. The name is deceptive. The story is actually quite gruesome, featuring cut-off ears. Another warning would be that many cases feature murder, and I am unable to list all of them. Maybe not for sensitive children. Thanks to my darling second son for writing this post, and for being our walking Sherlock Holmes Wikipedia.